Prepare yourself for our newest combo kit. This kit has everything you need to have a wonderful vaping experience and is made up of top of the line, new components that are sure to satisfy your vaping needs. 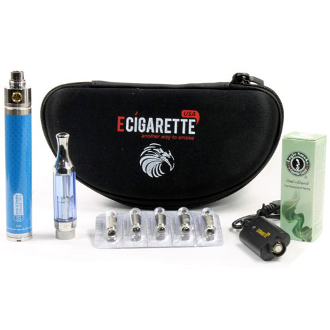 The two main components of this kit are the slim clearomizer and our powerful 2200mAh battery. The slim bottom feeding clearomizer is a sturdy hexagonal shaped clear plastic tank that comes in several fashionable colors. It can be disassembled giving you the option to rebuild it by replacing the burned out wicks with new ones. Another cool feature of this clearomizer is that its 510 threaded. This means that it will fit and work with any eGo 510 batteries. Along with these top notch components, this powerhouse kit comes with everything needed to begin (or continue) your vaping journey; A hard sided black E-Cigarette USA case to protect your investment, a USB charger with a cord and wall port, 5 replacement wicks to keep you vaping continuously, a 10ml bottle of e-liquid in your choice of flavor and a stainless steel beauty ring to maintain the continuity of the e-cigarette between clearomizer and battery. *Though the beauty ring does add protection from breaks, you should still take precautions to prevent dropping or bending, as the battery can still suffer damage from trauma. *Do not allow e-liquid into the center tube as it will leak out the bottom of clearomizer. Detach your clearomizer from the battery. Screw the battery onto the USB charger and plug the cord into a USB drive or the wall charger. When the charger light turns green, remove the battery from the charger and replace your clearomizer. *Charge for NO MORE THAN 5 hours after the initial 8 hour charge. REMEMBER: NEVER LEAVE YOUR BATTERY UNATTENDED WHILE CHARGING. To turn ON/OFF, press the button rapidly 5 times. The button will change color to indicate the level of life the battery has. White: 100-70%, Blue: 70-30% and Red: 30-0%. This battery has a total of 8 voltage settings available ranging from 3.3v - 4.8v in increments of 0.2v. Raise the voltage by twisting the knob clockwise and lower the voltage by twisting the knob counter clockwise.